So, how do these two messages reconcile with each other? The 1996 call for unity is being reissued but Hanson’s party’s policy is decidedly multi-racialist. How can you have “one people” in “one nation” unless those people are homogenous? The very name of the party is misleading unless it refers to White Australia since there is only one geographical nation. 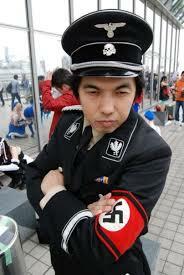 That One Nation must now mean Australians all thinking and behaving in uniformity. But given that One Nation courts the Christian right and is willing to accept gays that theory must be dismissed. Once upon a time One Nation DID signify one race, otherwise Hanson’s maiden speech to parliament would never have addressed the Asianisation of Australia; something that no longer worries her, apparently, if those Asians in Australia speak English, drive on the right side of the road, and tear-up whenever the flag flies on a day of national significance. Hanson has reinvented herself as one of the myriad anti-Islam entities bobbing around on the peripheries of Australian political life. And just like those other civic patriot groups, the message is that diversity is fine without Islam. Hanson stands shoulder-to-shoulder with other civics who denounces nationalists as “Nazis” because our nationalism is racial. Yet, in the never-ending incongruities of civics, they will shake hands with Africans in grip-and-grin shots meant to soften their public image, but leap on events such as the African gang riot in Melbourne. Presumably, these Africans are fine unless they riot. But Australian youth riot too. Anglo Aussie youth gets drunk and baits the police in gangs too, so clearly being law-abiding is a tenuous basis to define this “assimilation” of which they speak. What is they DO mean? It all comes back to opposition to Islam. 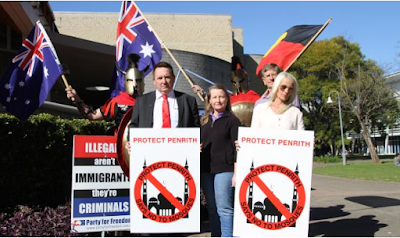 But how can you oppose Islam for its alien culture; its different dress; its architectural intrusions into the Australian urban landscape and yet ignore the blocks and blocks where the Asian community has transformed the environment to reflect their presence? Or in suburbs where a polyglot of foreign peoples with their different dress speak foreign languages and shop in stores designed in foreign motifs that sell unusual products which appeal to the tastes and requirements of foreign cultures? How can you join the controlled media’s hysteria about “terrorism” and not include Islander gangs, African gangs, and Asian gangs in that same category? Is this a religious divide only, or is a secular clash with Islam? If so, why would one secular group oppose Islam and the secular liberals support it? Is it a political thing? Do the left support Islam and the right oppose Islam and if so is it on religious grounds? 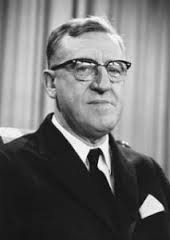 How can any of these civic patriot groups claim to be more Aussie than thou, yet have no idea about Arthur Calwell, or Jack Lang, or Percy Stephenson? 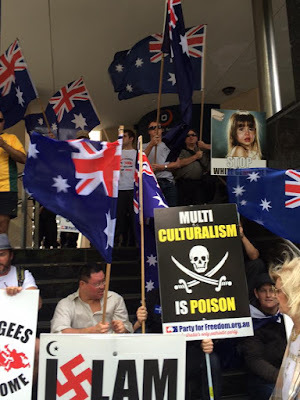 How can they dismiss, or shut out of their minds the White Australia Policy? How come they never ask, “What was so wrong with the White Australia policy that it needed changing?” Is it because a few educated middle class aesthetes yearned for something on their plate other than roast lamb on Sunday, or were Whites developing unconquerable abnormalities from living without the nourishment of diversity to enrich their life experience? If the answer is no, because from all their experience the Chinese identity is uniquely racial and cannot exist in the mind or imagination without all of its racial and cultural attributes, how can Australians accept all races and still be Australian? If they believe they can, then being Australian is no more of a matter than being the holder of a particular membership, such as in a club. If this is the case, there is no need at all for patriotism. Yes, all civics now hisses at and reviles nationalists because we DO consider the definition of Australian a racial question. We consider being Germans a question of race; French a matter of race; Swedish; Greek; Italian and African are all a matter of race. The same civics must be of the mind that a German can now be a Chinese person who speaks Deutsch and flits around in Lederhosen during Oktoberfest but it’s more probable that they don’t. The civics will post links to stories highlighting the crime of what mass migration has done to Europe. They will comment bitterly over the transformation that has robbed European nations and their peoples of their defining characteristics. Yet, they will call us “Nazis” for wanting to preserve what is unique and defining about being Australian. What then does Hanson want, just to use her as an example? See, if you have attended a Reclaim Australia rally you will know that those MC guests addressing the crowd will swear (and truthfully) they do not want to ban Moslems from this country they just don’t want “Sharia law”. The Liberal party does not want Sharia law either, nor does Labor or the Greens, so just what is the point in voting for Hanson? What does she stand for? Members of One Nation Western Australia could answer that quite well: in a nutshell she wants to be elected so that she can enjoy a validated politician’s payday. Hanson doesn’t care about Australia, because she doesn’t stand for anything that seriously concerns Australia. She is camera bait, too, and cynical players will trot her out just so that the association with her will prove favourable for themselves. These are the great mass of the patriot movement, all moving in this same tempo, to the same logic, back and forth in the same repeating directions without actually advancing anywhere because there is nowhere logically they can advance. Meanwhile, Whites are being outbred; White nations overrun; and globalists have made White people prisoners – not with armies – but with politics and ideas. There is nothing in any of the ideas of Hanson or the civics that offer any defence against White Genocide because they turn on the one crucial pivot that makes White Genocide possible: they oppose the idea of racial homogeneity. You are correct. The assimilation of whites with non-white immigrants is a critical part of the white genocide agenda. Another important point is that it doesn't matter if non-whites are all devils, angels or anything in between; whites have a right to exist and deserve protection from genocide PERIOD. We don't need to justify it to ANYONE. We have the moral high ground.